Maximuscle Progain Weight Gainer - Maximuscle Progain weight gainer is fairly popular but doesn't really compare on a value basis with many of the other Weight gainer products available. Maximuscle Progain will always have it's dedicated followers, after all, Maximuscle Progain does mix well and tastes OK, but it's not the weight gainer of choice in the shop. 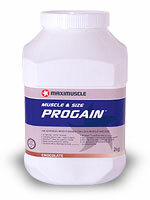 Maximuscle Progain Weight Gainer - If you’re looking to bulk up or add size, you won’t go wrong with Maximuscle Progain. Maximuscle Progain adds extra high quality calories to your diet, which is vital if you want to build muscle size and strength. Maximuscle Progain contains the same BIOMAX whey protein found in Maximuscle Promax Protein. Combined with resistance training, whey protein has been shown to increase muscle size and improve exercise performance, than training alone. Maximuscle Progain also contains MCTs, a unique form of fat which is less likely to be stored as body fat than long chain triglycerides. Maximuscle Progain includes Nutriose and Inulin, two unique low glycemic carbohydrates that don’t raise blood sugar and insulin levels, like sugar laden weight gainers do. Progain then includes the anabolic environment support formula, ‘Nitrogain’ a blend of NAC, Taurine, chromium and glutamine peptides. Take Progain every day with your weight training program to achieve your size goals. Mix 2 scoops (120gm) of MAXIMUSCLE PROGAIN with 500ml of water. Stir with a fork for around 10 seconds or mix in a shaker and drink within 5 minutes. MAXIMUSCLE PROGAIN™ is best when mixed with water, not milk or fruit juice. For best results: Start taking 2 scoops of Progain a day for a week, if you don’t notice an increase of around 1-3lbs a week, add another scoop to your daily servings. Keep adding scoops each week until you are gaining 1-2lbs weekly. If you want to put on muscle you should be using Maximuscle PROGAIN in conjunction with an effective training regime and high protein diet. You should monitor your fat levels to make sure the weight you are gaining is muscle and not fat! Some people choose to add extra protein to their MAXIMUSCLE PROGAIN to boost protein intake even further. Some great tasting flavours can be achieved by mixing Maximuscle PROGAIN and Maximuscle’s protein powder, PROMAX. For optimum energy levels and recovery, try taking half a scoop of PROGAIN™ around 45 minutes before training and 1 scoop immediately after! Weight gain or meal replacement.